You are here: Home / Restructurings / Intellisys Group, Inc.
With revenues in excess of $200 million, Intellisys was an industry leader in the design, sale, installation and servicing of custom integrated audio, video and data networking, conferencing and presentation systems.Professionals of M&A Capital first aided Intellisys by, absent engagement, augmenting its discussions with its senior lender to increase its availability under its revolver to facilitate growth. Later, when its private equity firm and management team owners were split as to the direction of the business, M&A Capital professionals presented an analysis of the company's strategic alternatives, including potential strategies for the sale or recapitalization of the company as well as strategies for selling individual operations. After a consensus was developed, M&A Capital began its process to identify, educate and negotiate with a qualified buyer community. 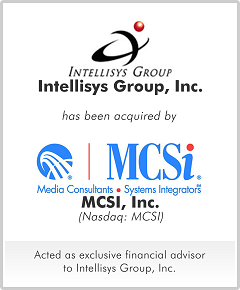 Upon the purchase agreement being signed, MCSi contemporaneously infused $5 million in bridge financing to both improve Intellisys' operations and the certainty of closing the transaction.